In December 2010, Scenic Hudson protected 296 acres of upland forest and tidal wetlands along the Hudson. Freshwater tidal wetlands at Little Nutten Hook. Robert Rodriguez, Jr.
One of Scenic Hudson's top conservation priorities, this breathtaking landscape features an expansive upland forest, freshwater tidal wetlands at the mouth of Newton Hook Creek and 800 feet of Hudson River shoreline. An integral part of the Hudson River National Estuarine Research Reserve at Stockport Flats, the land is located between the Nutten Hook State Unique Area and Hudson River Islands State Park on Gay's Point. It is visible from many public parks and preserves, including Nutten Hook and Scenic Hudson's Four-Mile Point Preserve and Vosburgh Swamp Natural Area. Recreation at Stockport Flats—fishing, boating, bird watching—contributes substantially to Columbia County's tourism economy. Wetlands there safeguard the water quality of the Hudson, source of many communities' drinking water, by trapping contaminants that otherwise would reach the river. The property's conservation also is critical to maintaining the extraordinary biological diversity of this state-designated Significant Coastal Habitat and Biologically Important Area. 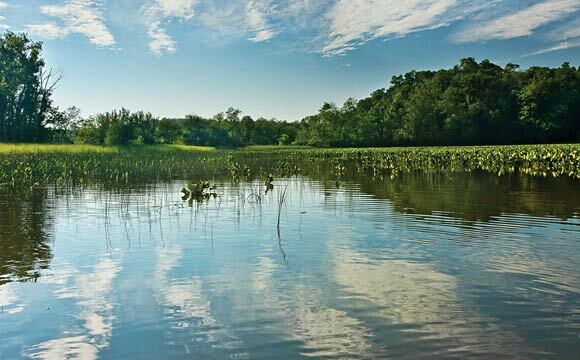 It provides valuable feeding, resting and nesting habitat for migratory waterfowl and marsh birds, and serves as an important nursery and feeding grounds for striped bass, shad, alewives and herring. Bald eagles, egrets and great blue heron frequently are spotted along the shore. In addition the land contains a Native American archaeological site.